You know how we're always bitching and moaning about how Europe gets cooler cars than we do? If these reports are accurate, then there's one more we can add to that list: a turbocharged four-cylinder Ford Mustang with 300 horsepower. Reports this morning have surfaced from Edmunds and Autocar that say the redesigned 2015 Ford Mustang (or 2014.5 Mustang, we're not sure yet) will get a 2.3-liter turbocharged Ecoboost engine based on the 2.0-liter motor in the Ford Focus ST. The larger displacement means a boost of about 50 horses. The four-cylinder engine is not expected to be offered to Mustang buyers in the U.S. The small four-cylinder engine will be offered to European buyers as a more economical, low-emissions alternative to the V8 engine in the Mustang, which is likely to be highly taxed in Europe. 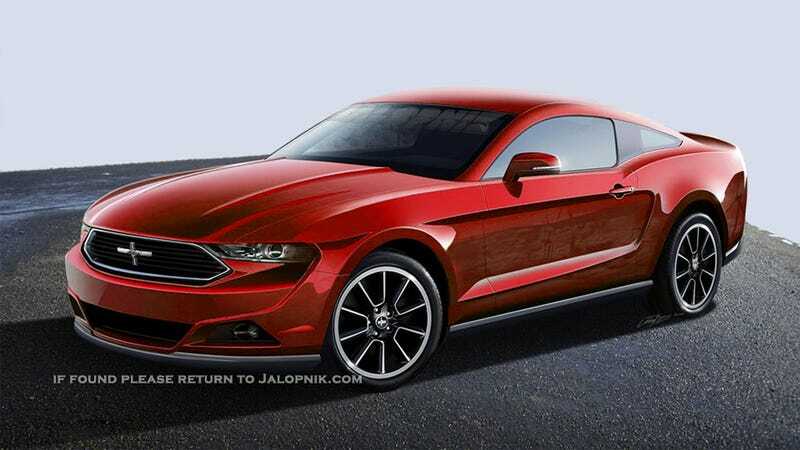 European buyers who feel that a Mustang should only have a V8 engine will be offered that as well. Astute Mustang scholars will recall that this setup sounds awfully similar to the Mustang SVO from the 1980s, which also had a 2.3-liter turbo four and has become something of a coveted classic today. How do we feel about this, Jalops? Are we mad we won't be getting the neo-SVO, or are the V6 and V8 good enough for us Americans?